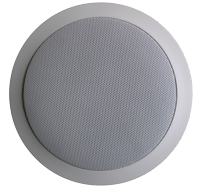 The AXA Design flush mount speakers are designed to be mounted in the ceiling. The round in-ceiling speakers perform exceptionally well giving a full bodied sound with excellent depth and accurate audio reproduction. Ideal as part of a complete multi-room audio distribution system these speakers also work perfectly well as a pair of rear speakers in a multi channel home theatre setup or great for businesses wanting a space efficient, full sounding audio system. The AXA Design SC series speakers are available in 6.5” and 8” round in ceiling speakers with 6dB crossovers which provide excellent high and low range audio separation between the woofer and tweeter ensuring that neither driver is driving frequencies outside it’s optimum range. They have quick install spring cable clips and installation clamps that will allow them to be installed in thinner ceiling linings like fibre cement sheeting sometimes used in exterior patios or eaves. The powder coated aluminium grills also give good protection and longevity to the look of the speaker. The AXA Design Performance Core series speakers are available in 6.5” and 8” round in ceiling speakers with 12dB crossovers which provide excellent high and low range audio separation between the woofer and tweeter ensuring that neither driver is driving frequencies outside it’s optimum range. They have strong gold plated binding posts and installation clamps that will allow them to be installed in thinner ceiling linings like fibre cement sheeting sometimes used in exterior patios or eaves. The powder coated aluminium grills also give good protection and longevity to the look of the speaker. The AXA Design Performance Core series speakers are available in 6.5” and 8” round in ceiling speakers with 12dB crossovers which provide excellent high and low range audio separation between the woofer and tweeter ensuring that neither driver is driving frequencies outside its optimum range. They have strong gold plated binding posts and installation clamps that will allow them to be installed in thinner ceiling linings like fibre cement sheeting sometimes used in exterior patios or eaves. The powder coated aluminium grills also give good protection and longevity to the look of the speaker.